Building Academic Retention through K9’s (B.A.R.K.) 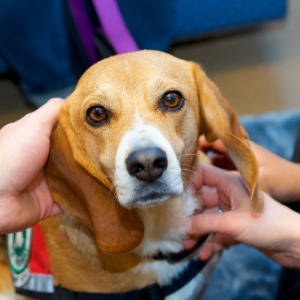 is a popular campus program that brings together university students and trained therapy dogs and handlers in an effort to reduce stress, combat homesickness and foster interpersonal connections. Under the direction of Dr. John-Tyler Binfet, B.A.R.K. promotes the overall social-emotional wellbeing of students. Your support will help B.A.R.K. to continue running programs and helping students in need. By making a donation, you will assist with ongoing operational costs for our programs both on campus and in the wider community, and supplies for dogs and handlers. If #DayoftheOK is shared 110 times, the alumni UBC Student Leadership Committee will donate $110 to the B.A.R.K. program. Challenge Complete! If #DayoftheOK is shared an additional 110 times, Richelle Matas will match the UBC Student Leadership Committee’s donation. Challenge Complete!